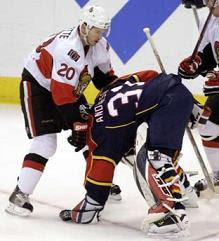 OTTAWA â€“ Rostislav Olesz and Nathan Horton scored goals 48 seconds apart early in the first period and the Florida Panthers beat the Ottawa Senators 3-1 on Wednesday night. Cory Stillman assisted on Horton’s goal that made it 2-0 in the first, then scored his third of the season midway through the second to restore Florida’s two-goal lead. Craig Anderson made 41 saves in his first start of the season. The backup goalie dove to his left to make a glove save on Antoine Vermette’s shot as Ottawa enjoyed a power-play for the final 3:05 of the third after David Booth was assessed a double minor for high-sticking. Florida, coming off a 3-1 loss in Montreal on Monday night, has alternated losses and wins in getting off to a 3-3 start. Anderson had a great night against a team that scores plenty of goals. He was 8-2 in his last 10 starts of last season, including back to back shutouts. Yes I’ve said this before but it bears repeating. Why do Florida coaches have so little confidence in Anderson? Two years ago then coach Jacques Martin started 41-year-old Eddie Belfour over 20 games straight rather than give Anderson even one game in net. Anderson spent large amounts of last season on the bench also. Tomas Vokoun is a great goalie, but he needs rest from time to time. Florida should use Anderson more often or shop him around. Based on his play since last year, some NHL may want the Chicago native. Ottawa could do worse, right now they have journeymen Martin Gerber and former Panther Alex Auld splitting goalie duties. How did anyone think Tampa Bay could be a Stanley Cup contender this year?